WILLEMSTAD - Through the easing of the admissions requirements, the local aviation company InselAir has been able to attract a group of experienced pilots. The result of this is that by the end of next month the acute shortage of pilots will be resolved. These are temporary foreign workers. In the meantime, the current co-pilots will be trained as captains, which in turn will ensure a local crew in about five months. 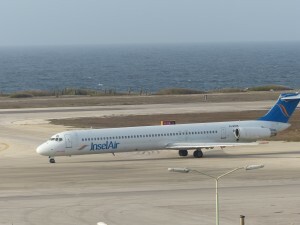 Insel Air will then start looking for new co-pilots. Currently, the situation is still the same. Because of the shortage of pilots the airline has been confronted with many delays, “but the solution is there,” says Director Edward Heerenveen. The relaxation of the admission was made after the Minister in charge of aviation Suzanne Camelia-Römer said that the adjustment will not jeopardize the process of taking the Curaçao aviation from category 2 back to 1.